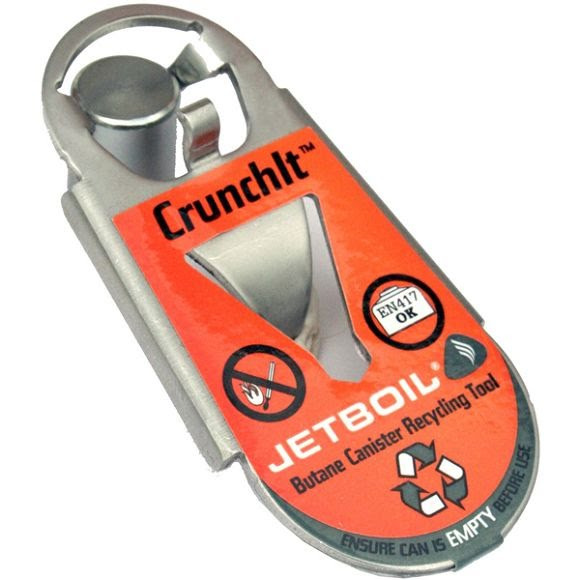 Enjoy butane canister convenience without creating landfill waste, thanks to Jetboil&apos;s CrunchIt Butane Canister Recycling Tool. Safe, fool-proof, and compliant with recycling standards, CrunchIt punctures Jetboil Jetpower (and certain other) butane fuel canisters, rendering them recycling bin ready and headed for re-melt and reformation. Do it right- CrunchIt! Recycling rules vary, please check with your local municipal or county waste facility to ensure full compliance with recycling regulations in your region. Lightweight, rugged stainless steel construction. Safely vents fuel prior to puncturing. Useful Jetboil toolkit with bottle opener and jet orifice wrench integrated into handle. Clips onto carabiner or key ring for convenience.